Arsenal and Tottenham have reportedly been alerted to the possibility that Jose Mourinho may opt to axe Anthony Martial from his plans for Man Utd. The 22-year-old has continually struggled to establish himself as a first-team regular at Old Trafford since Mourinho arrived, and that trend has continued this season as he’s made just one appearance thus far. Martial has featured prominently given he’s made 42 and 45 appearances respectively over the last two seasons, but ultimately it hasn’t always been as a starter and that has seemingly sparked the problems. 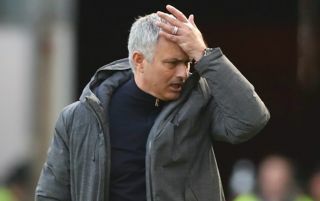 Further, as noted by the Daily Mail, there were reported issues between the Frenchman and Mourinho this past summer after he left the club’s pre-season tour for the birth of his son, and so it doesn’t sound as though the pair enjoy a particularly close relationship. Now, it’s claimed by The Sun that the Portuguese tactician has ‘lost patience’ with Martial and could be ready to axe him from his plans moving forward with both Arsenal and Tottenham specifically named in the report as potential destinations. Given Mourinho has Alexis Sanchez, Marcus Rashford, Juan Mata and Jesse Lingard all competing for places behind Romelu Lukaku, it would appear as though he could live without Martial if an exit was to materialise. As for Arsenal and Spurs, both Unai Emery and Mauricio Pochettino could arguably do with adding more quality in the wide positions and given Martial’s initial impact at Old Trafford, there is certainly plenty of talent and quality there to rediscover. However, it has to be questioned as to how sensible it would be from a United perspective to sell to a direct rival and risk seeing Martial flourish in England elsewhere. In turn, the Sun add that Mourinho would prefer to sell abroad, and so time will tell if a suitable offer arrives with Martial seemingly heading for the exit door at Old Trafford.